Not like this, Shawn Layden! 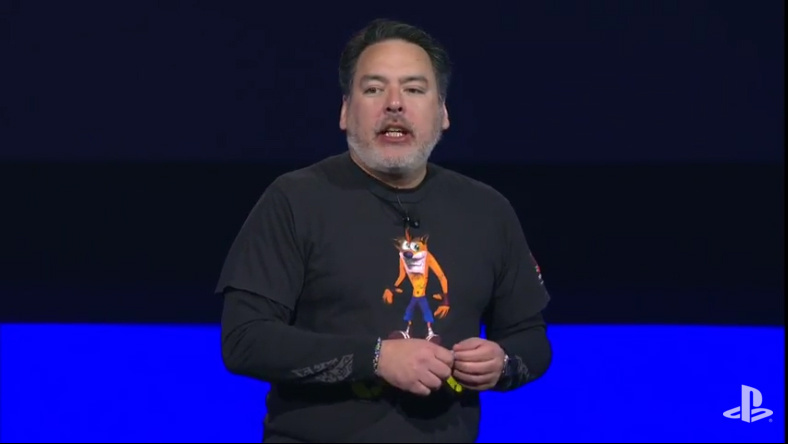 We were starting to really like SCEA's new president, but you absolutely can't walk on stage at a PlayStation press conference wearing a Crash Bandicoot t-shirt if you're not going to… Y'know, at least announce that the orange furred favourite is making a comeback. Our live chat was absolutely packed with comments from people who believed that the president's choice of attire meant that the classic character was making his triumphant return. Sadly, today's press conference ended without any mention of the icon. What a bummer! I'm going to predict they're saving it for next E3. Similar to how SE trolled the hell out of people last PS Experience then announced the FF VII Remake at E3. I could see that, but still lame to do this in front of your most loyal audience. Lol, that's twice that we've been trolled at PSX. Guess this will happen every year. Shawn Laden is like Phil Spencer's nerdy, loser brother. Well, that was a complete waste of 100 minutes. Started out at the top with some Uncharted 4, and then... oh dear, downhill all the way. Glad there are already some games announced for the coming year that I want, because there was nothing at all in there that I'm interested in. He's on the couch after still wearing the shirt. I'm watching on my PS3 Live Event, not sure where else this is streaming. That was a massive d*ck move, I'm not even a Crash fan and I felt that! There has to be something in the works. I wouldn't rule out his return yet. I think it's coming, it's just that it wasn't in a state to be shown yet. Hopefully E3 is where we FINALLY see Crash make his big return. Have faith! Hes going on the show floor now, maybe he'll get stoned? I'm very sure there is something in the works, but that's besides the point, fing show something, it's not even a good troll. Phil Spencer and Shawn Layden are one in the same, along with Reggie. Just PR guys. I'll never get why people fall in love with corporate figureheads. You sure are right, the thing is, Spencer pulls it off well, layden always looks akward. @sub12 Layden's cool, he just needs to stop wearing Crash Bandicoot shirts! Spencer is definitely better at fooling people, agree with you on that. He's like Jack Tretton was for Sony. Layden is your typical, robotic PR guy. Yawn Layden, who sounds more boring than Jack Tretton, got a laugh off so many people. Surreal. I like Crash but that is a bland, boring shirt. Fits his personality at least. Well this was pretty much nothing for me. I'm so happy I have Fallout 4 (the true GOTY) which will last me well into the next year and beyond. What an adventure I had today, some truly lateral thinking thanks to the ability to hack robots. Man, oh man what a carnage. A total pandemonium that startled me with its reach and intensity. I am sure I killed a whole story line with this one, but, to hell, it's the wastelands and I have a growing settlement to support. Wow, so much hate! Shawn's an okay guy. He's just a little rusty. I actually like Shawn. I'm telling you, it's a tease for something to come later. Return of Rare properties and the Majora's Mask remake all had these early teases. Something Crash related will happen, just a little bit later. @Churchy You're saying... WE GOTTA BELIEVE. I have to agree with you Sammy. It might be foreshadowing, but what if he chose the shirt because he liked it? At the very end, the screen goes black. Silence for several seconds. Then a montage of all the games they announced. I died a bit inside when the conference ended this abruptly. @Neolit You can't mess up storylines in FO4, don't worry. People disagree on whether or not it's a good thing, but from Oblivion onwards, Bethesda have been increasingly squeamish about letting players kill important NPCs or mess up storylines. You can't fail in FO4 unless you die, not including ignoring a village when it randomly comes under attack (though that doesn't really matter, anyway). Crash VR would be very nice! No it wouldn't, because it would look like crap due to the compromises needed for VR on the PS4. @slampog lol. I'm posting that on Twitter, thank you.